This menu will let you access settings having an impact on the whole Webcampak. "Reset" let you reset Webcampak to factory defaults. This part is only available with Webcampak provided pre-configured by Eurotechnia, when started this will activate a VPN tunnel allowing us to connect for maintenance purposes. Webcampak is provided with an internal FTP server, each source has its own FTP account and a global account is available to reach content shared between all sources. The account is disabled by default, you have to click on "Create/Edit user" once to activate the FTP server globally. If cameras are identical, the system will insert a specific tag within each camera, and will look for this tag regularly to ensure it is still attached to the correct source. Activate this module if a phidget electronic board is connected to your system. By activating this module, your Webcampak will send us stats usage. This does only include general details (software version, CPU, operating system mostly). 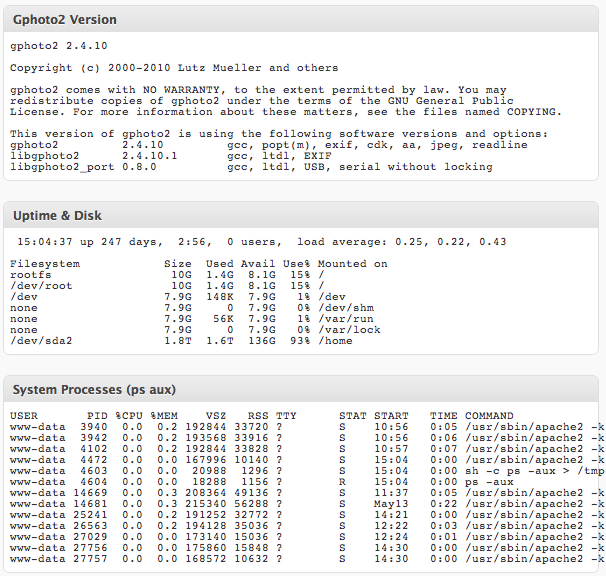 The three blocs above display system information (Gphoto version, uptime, disk usage, process). 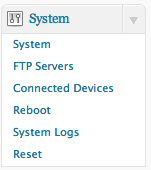 This section let you define all FTP servers that can be used by sources. You can configure up to 30 different servers, You can notice on this capture that servers 2 and 6 actually send pictures to another source of the same Webcampak (using IP 127.0.0.1). This section displays details about devices physically connected to your Webcampak. This two first blocs provide more details about connected cameras. The first one display connected cameras and their ports, the second one provides more details about cameras' capabilities. For the camera to be compatible with Webcampak, "Capture choices" line must include "Image" (as displayed on the above screenshot). 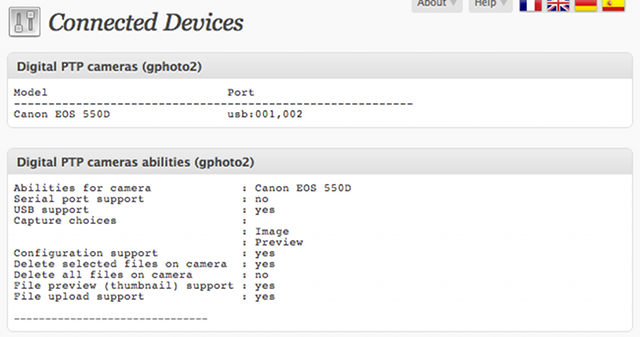 As you can see on the above capture, a "Canon EOS 550D" DSLR camera is connected to USB port "usb:001,002". USB ports will change each time a camera is restarted or connected/disconnected. Activate the appropriate multi-cameras option in "System" if multi cameras are going to be used simultaneously. The bloc above display devices connected via USB, DSLR cameras and USB webcams will be displayed here. If a specific devices is not detected here it means it will not be possible to use it with Webcampak. A Guillemot webcam: "Bus 002 Device 006: ID 06f8:300f Guillemot Corp. "
A Z-Star webcam: "Bus 002 Device 004: ID 0ac8:301b Z-Star Microelectronics Corp. ZC0301 Webcam"
A Canon point-and-shoot camera: "Bus 002 Device 007: ID 04a9:30c1 PowerShot A520 (PTP mode)"
zc3xx : is the other USB webcam. Webcampak is compatible with a large number of USB webcams, but to ensure proper operation it is necessary to detail the native resolution of the webcam. We can find here our two webcams, resolution is displayed as "fmt.pix.width" and "fmt.pix.height". This section let you reboot Webcampak. All settings will be saved and the system will come back online automatically after reboot. Webcampak keeps track of all major actions, those details can be useful in case of issue. Using this section you can have a look into previous actions. reset configuration of all sources. delete all pictures and videos. Take extra care, those actions are definitive.